HOPKINSVILLE, Kentucky — This is simply a love story. A family doing everything they can to save their children. Riley Frost, 5, looked healthy at birth with no signs of any illness. She was even feeding herself three years ago. Now, however, she and her 3-year-old brother Harrison are dying. "They started out normal," Whitney Frost, their mother, says. "We thought everything was fine, but after about a year, they both started to regress. Stopped doing things they were once doing: talking, walking, eating on their own ..."
Both children have a rare, terminal illness called infantile neuroaxonal dystrophy. It is a genetic disease and both parents are carriers but until their children began showing signs of it, they never knew. 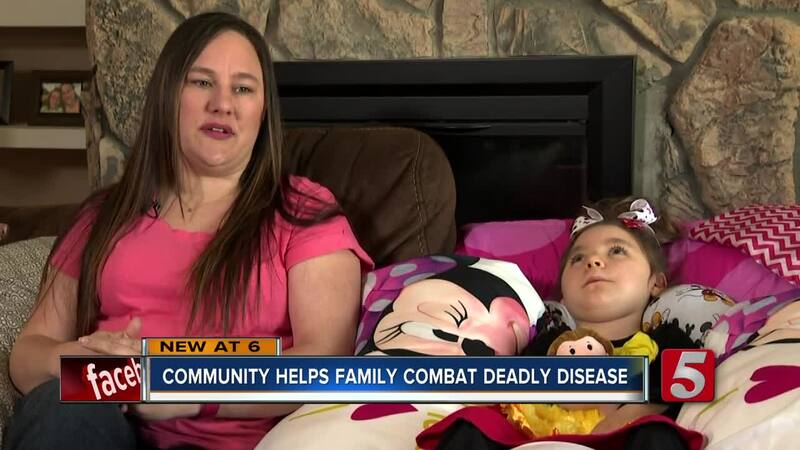 Only 16 kids in the United States have this extremely rare and life- threatening illness. "My husband and I were devastated, and it's still not easy to talk about, but when we first got the diagnosis we were bitter and angry at God, you know," Frost said. Even the best day is a tough day in the Frost home. The demands are difficult — each child has a nurse, but their care is 24 hours a day, seven days a week. "They eat very little by mouth, they choke a lot, can't move or talk. They are completely dependent on us for everything," she said. Frost recently found a clinical trial that might help her children. For the last 45 days they've been taking an experimental medication through a New Jersey hospital, and it is showing promise. "People tell me all the time 'I couldn't do what you do, I couldn't deal with it,' " she says. "I tell them, if you have kids, you know how much you love them and you would do anything for them. I'm just doing what you do for your kids." The trial is a year, but the goal, is a cure. The family has made a GoFundMe page to help pay for the new drug. Click here to donate.